There are a lot of things I look for at sales. The one thing I enjoy finding about all other things is not displayed on any table or hidden in any attic...sometimes its just there. This weekend I was fortunate enough to have one of those rare experiences when someone asks you what you're looking for and when you tell them, they respond with: "Wait right there!" After leaving to search inside their home or garage, they return with something good. On this late September Saturday day it was...a coincidence. What she handed me was a large pack of old newspapers. While it may seem I was only aiding and abetting her desire to recycle, actually she had some pretty interesting papers in those bundles. 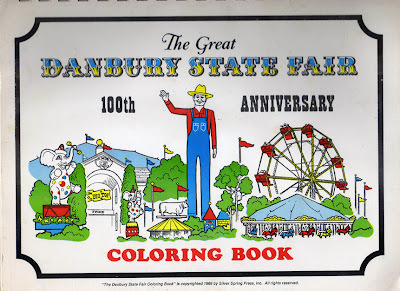 We struck what each of us felt was a fair deal and later that night while going paper by paper...inside was this 1969 coloring book from the State fair. The coincidence comes from the day it was purchased - right in the same period when the Fair would going on!...If it were still in existence. I call that a coincidence. The Great Danbury State Fair began in 1821 as an Agricultural Fair. Local farmers brought forth their biggest pigs, their beefiest cattle, and sheerly beautiful sheep, as well as all the other animals down on the farm all to judge in competition with other area and regional farmers. This also included crops and baking, canning and preserving, and demonstrations of strength and control in oxen pulls. 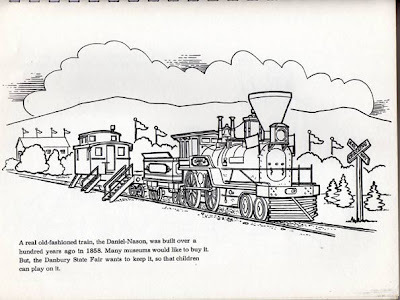 There were activities for the kids which grew into rides and shows, circuses and midway hawkers. It truly was a big deal for more than 100 years. 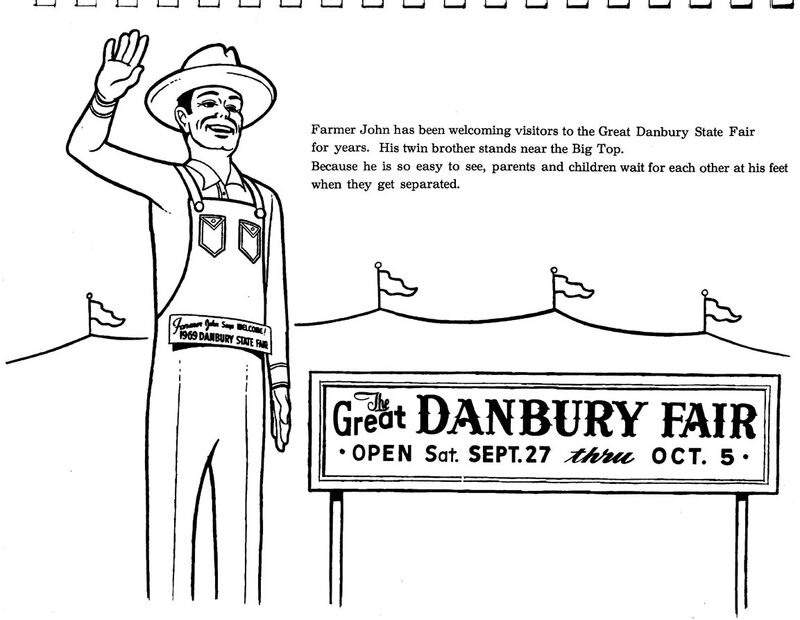 Unfortunately, in 1974 the fair's owner passed away and the downhill slide began. Eventually, the land the fair was located on became more and more valuable for retail development. In 1981 the fair was closed and 5 years later re-opened as a large shopping mall named and designed in the theme of the State Fair. Difficult to replace more than 100 years of history, but one year after it was closed thousands of items were auctioned off and spread to the four corners of the collecting world. But, it is true that - "what goes around, comes around," and that's apparently how I ended up with this little commemorative gem. 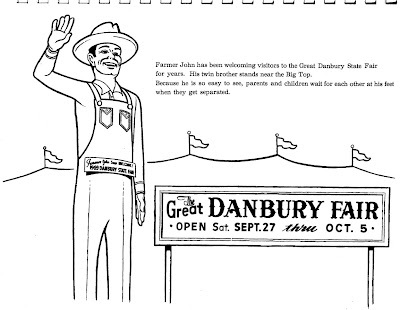 My husband's family still lives in Danbury and remembers the DSF by having a Danbury Fair Days picnic in the fall. We all enjoy "fair foods" like cotton candy, fried dough, sausage & peppers and make a day of it. No ox pulls or sheep shearing though. I so miss the fair. Never has been one like it since the fair left. Been to others but I always compare it with Danbury. It's so sadly missed! Ad Quiz #13 Whatsamatta? Cat got your Breath? Thin is in, but fat's where it's at!